At Business Healthy we have taken inspiration from the New Economics Foundation’s ‘five ways to wellbeing’ to help inform and shape our blog content, each month focusing on a different topic. ‘Be active’ was the foundation for our September blog posts, including contributions from Exercise in the City and World Cancer Research Fund UK. The Five Ways to Wellbeing were developed by nef as part of the government’s Foresight Project on Mental Capital and Wellbeing. The Foresight project was a two-year, state-of-the-science review led by the Government Office for Science and published in 2008. It synthesised research from some 400 scientists on the causes and consequences of mental capital and wellbeing, and explored the challenges for government in supporting the mental well-being of the population. Foresight commissioned nef to develop a set of simple, evidence-based public health messages about the kinds of activities that promote positive mental health. Based on the Foresight project’s main science reviews, the Five Ways to Wellbeing were launched alongside the final report in a convenient postcard format. They were deliberately framed so as to be straightforward for a non-specialist audience to understand, simple, memorable and broad enough in scope to be relatively non-prescriptive whilst remaining true to the evidence base. Business Healthy chose to follow the Five Ways to Wellbeing as much of what affects our well-being at work relates to organisation-wide factors like job security and quality of management. 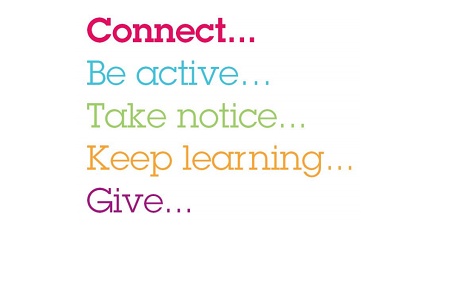 You can find out more about the Five Ways to Wellbeing here.